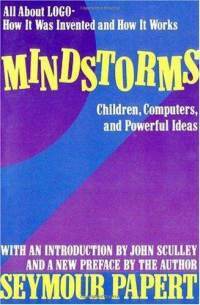 This book is a classic written more than 30 years ago by Seymour Papert. To me, its age makes the book even more mind-blowing, as the ideas still seems very powerful and relevant The first word of its title gave name to a LEGO product line of programmable robots, but is also a representative description of my state of mind while reading the book. So what are these powerful ideas ? Seymour Papert was a professor in psychology and mathematics that worked closely with Jean Piaget in Switzerland and later moved to the states where he worked and continued his research at MIT. In short his project was to revolutionize teaching (of mathematics and physics in particular) by giving children access to personal computers with a programming language, TURTLE Logo that he developed over several years for this purpose. He foresaw that it was just a matter of time before everyone would have access to powerful personal computers produced at very low cost.